Who among you bought into the global warming crap? Has this winter changed your mind? No? Then you are fanatical indeed! 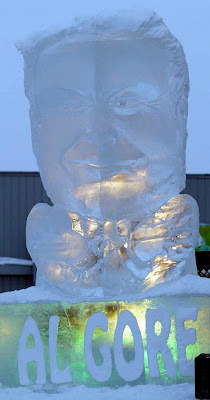 This ice sculpture of a shivering Al Gore is pretty amusing! FAIRBANKS, Alaska (AP) — A critic of global warming is responsible for the icy glare Al Gore is giving this Alaskan community. Local businessman Craig Compeau on Monday unveiled an ice sculpture of the 2007 Nobel Prize winner and leader in the movement to draw attention to climate change and global warming. The 8 1/2-foot-tall, 5-ton bust of the former vice president dominates a downtown street corner from its perch on the back of a flatbed truck. Compeau says he's a "moderate" critic of global warming theories. He used the unveiling of the sculpture to invite Gore to Fairbanks to explain his global warming theories. He says it will stand through March unless it melts before then. It was 22 degrees on Monday. Gore could not immediately be reached for comment Monday night. whats up with him now? Wherever he is, he is still preaching is global warming crap.